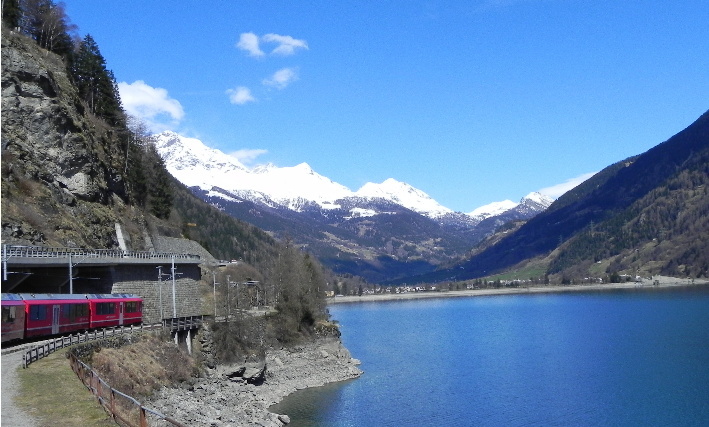 On my recent visit to Italy I took the chance to take an excursion on the Bernina Mountain Railway, which links Italy and Switzerland through the Bernina Alps. For years I have travelled on the West Highland Railway and watched as tourists press against the windows to take in the stunning scenery. It was now time for me to do likewise. 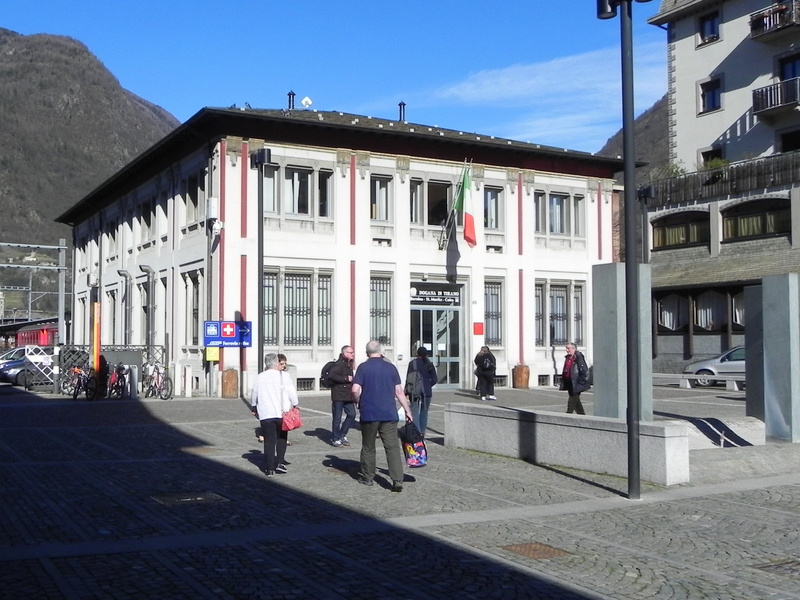 Tirano mountain railway station. 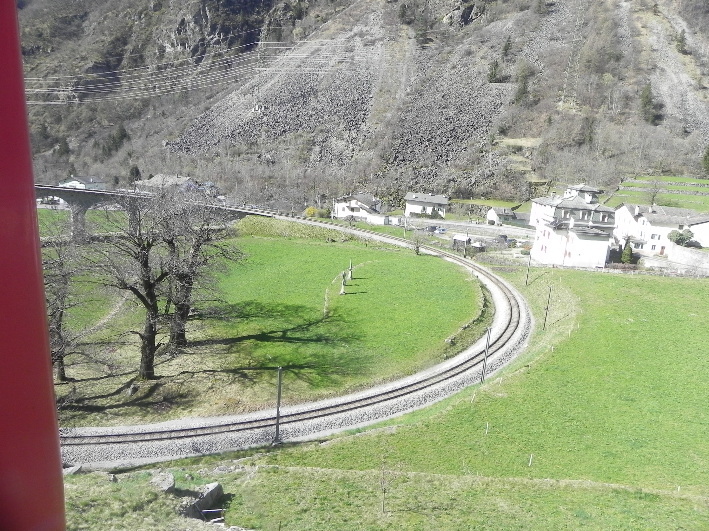 The shadow on the left is that of the state railway station. 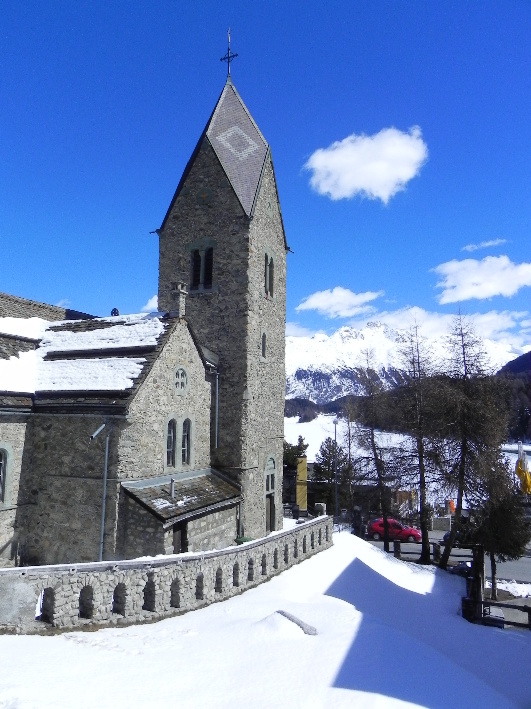 I was staying in Griante on the shores of Lake Como, and this excursion required an early start with the journey taking around 90 minutes to the town of Tirano. 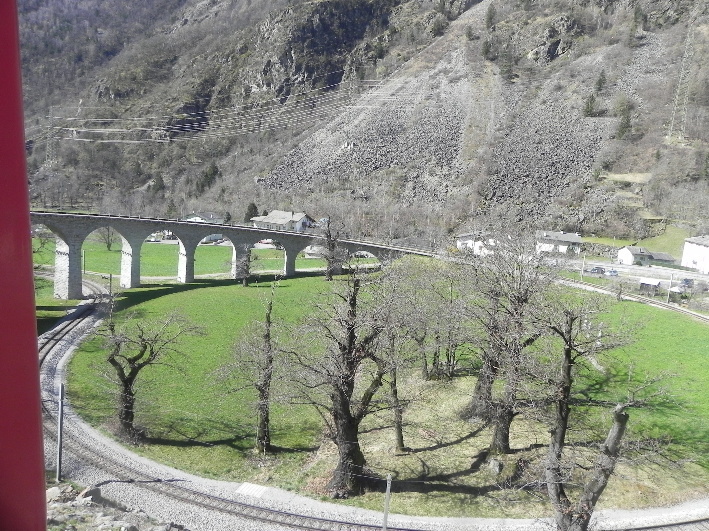 This is an interchange station, as trains run here from Milan. 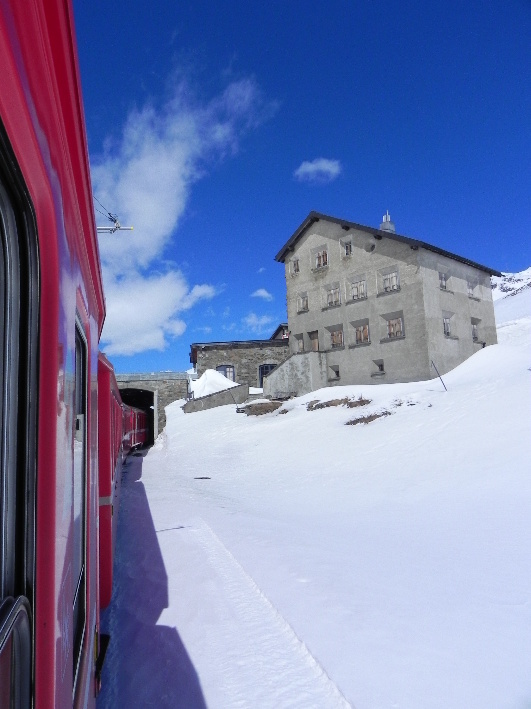 We passed through the Regional Railway station into a small square, where the Bernina Rail station sits. We had half an hour to spare here and there are one or two shops which would be of interest to the outdoors types if you have time and money to spare. 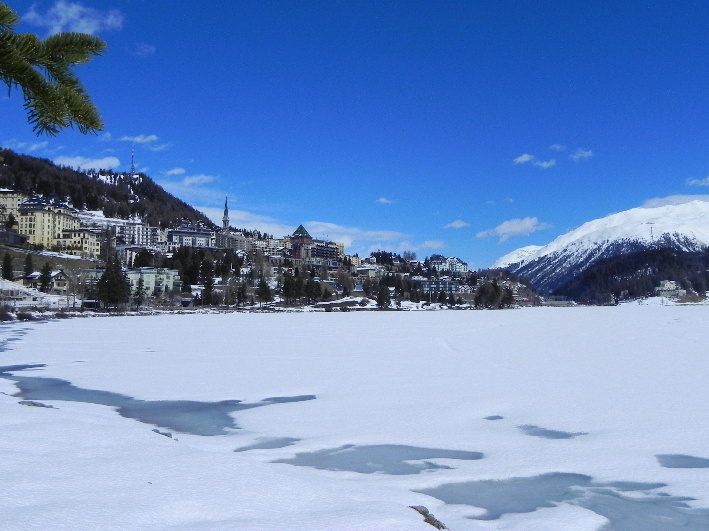 The train runs from Tirano to Chur in Switzerland, but our excursion was shorter, from Tirano to the world famous ski resort of St Moritz, a journey of around two hours, taking in some of the most photographed sections of the route. The only unfortunate aspect was that due to engineering works we would be travelling the last section by rail replacement coach. Some things are the same the world over! 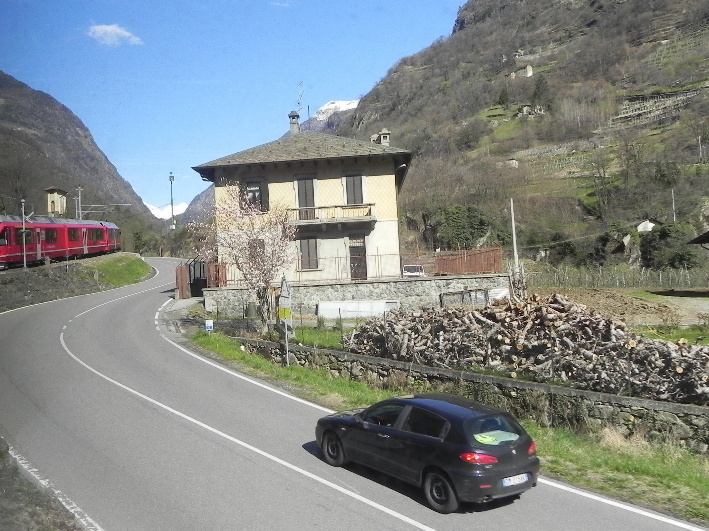 The train departs from Tirano and rather bizarrely runs ALONG the road. No fence or barrier separate road and rail traffic and its a very odd sight, watching car and train share road space. 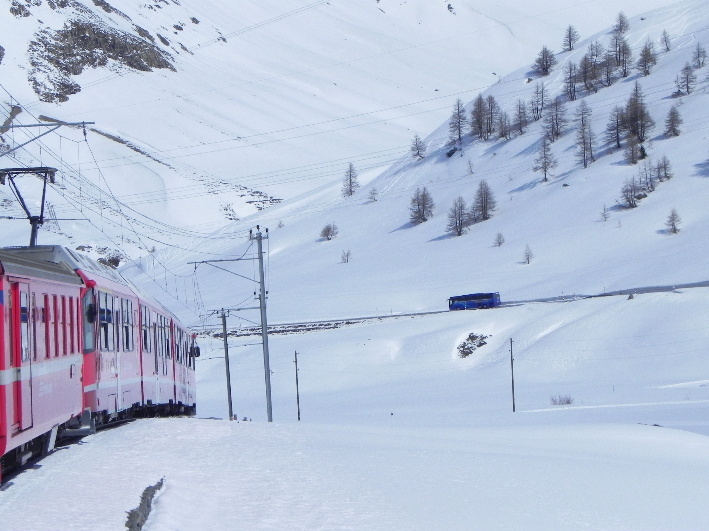 The rolling stock is spotlessly clean and well suited to the journey. 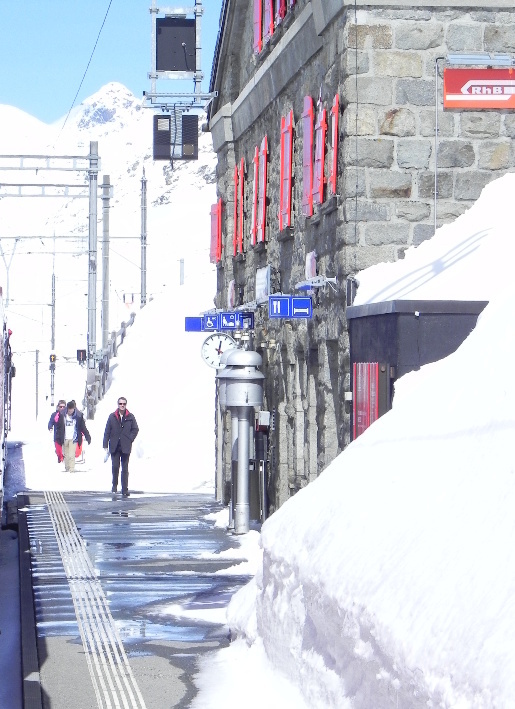 The temperature can be controlled by the passengers, which is useful as the windows open to allow heads and cameras to stick out of the train. 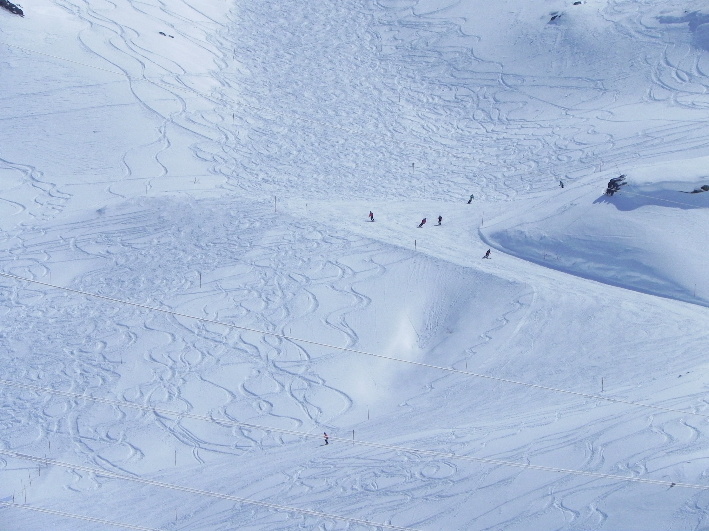 On a fine day like this one it allows an unrestricted view and reflection free photographs. 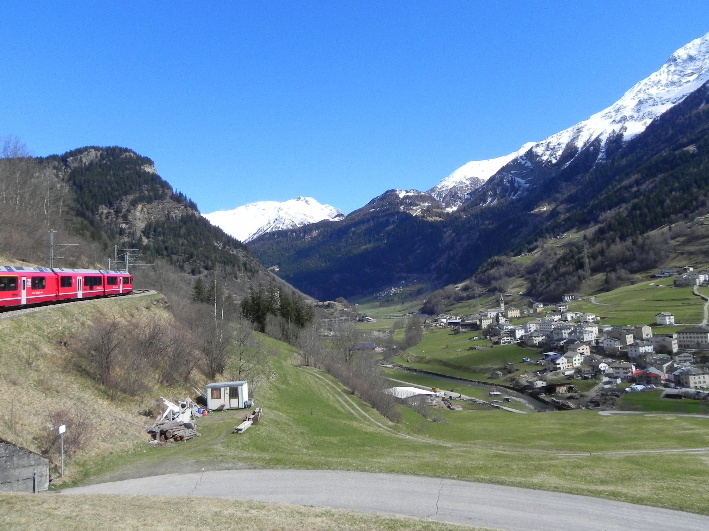 The train climbs upwards and we are soon at one of the signature features of the Bernina Railway, the Brusio Spiral, a circular viaduct constructed to overcome the gradient at this point which was greater than the engines of the day could manage going up and which would require excessive and possibly uncontrollable braking when coming down. I found myself on the ‘wrong side’ for photographs and would recommend being on the left hand side (facing direction of travel) for the best view of this feature as you can see the train curling round on itself. 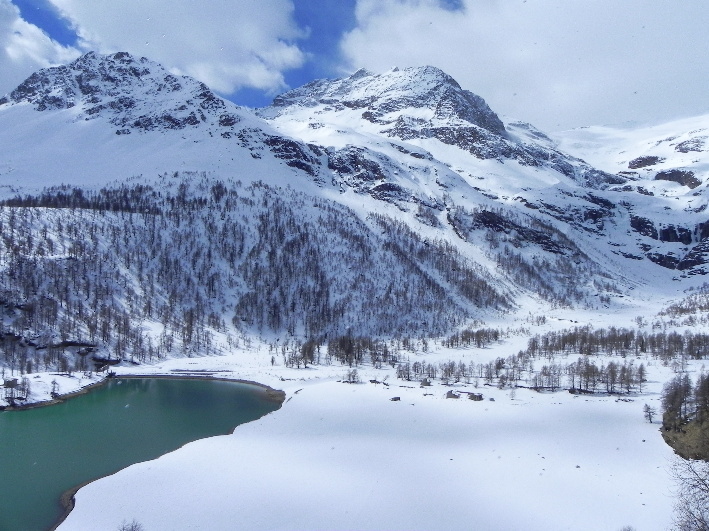 Seated on the right hand side I found I had fantastic views of Lake Poschavio, and San Carlo, but was on the wrong side for some other features such as Lago Bianco. 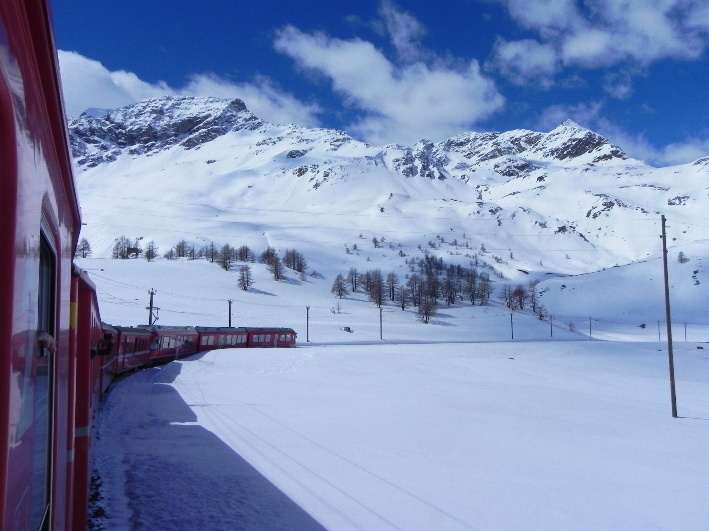 At the start of the journey only my window was open and as it creates a draught I didn’t want to overdo it, but within a short time every window was open and people were leaning out happily videoing and clicking away, and they stayed that way through the snow covered Bernina Pass until the rain terminated at Pontresina. 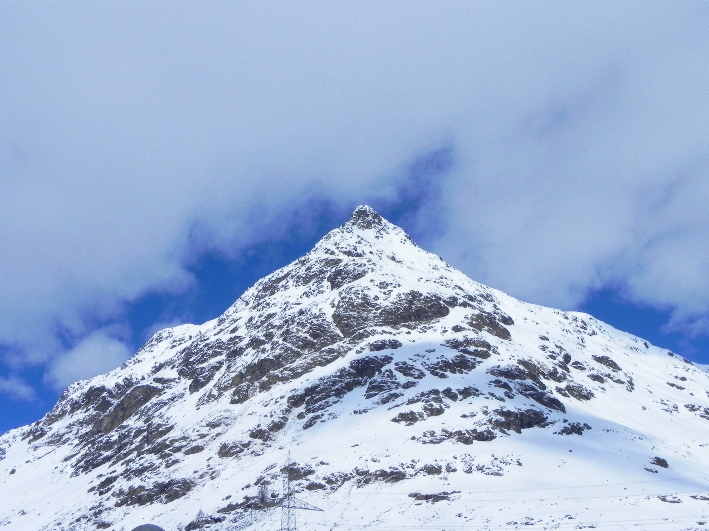 Oh, for ice-axe and crampons! 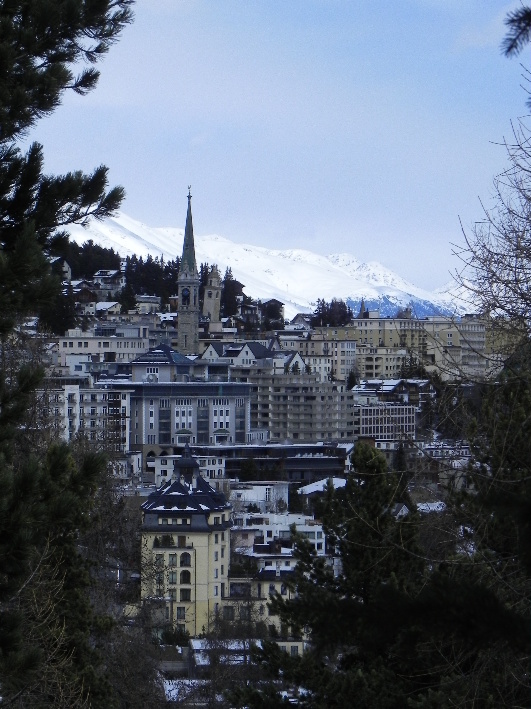 Our coach took us the last few miles to St Moritz, playground of the rich and famous. 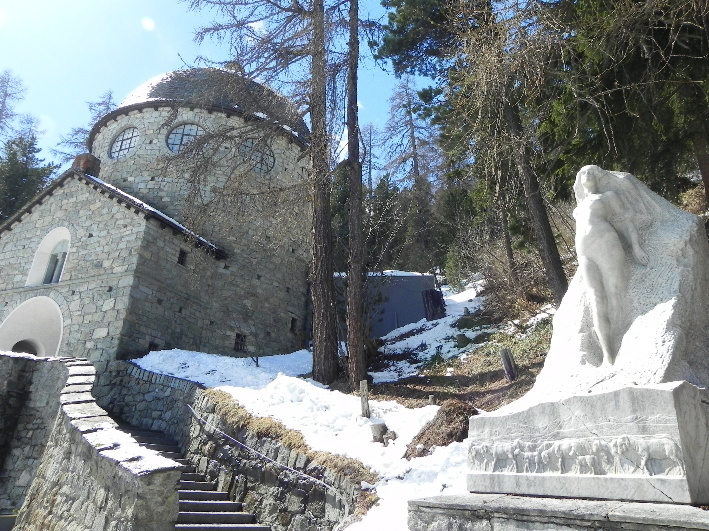 Being neither of these I initially avoided the town and instead managed to find a short nature trail laid out on the hillside above the Segantini Gallery. 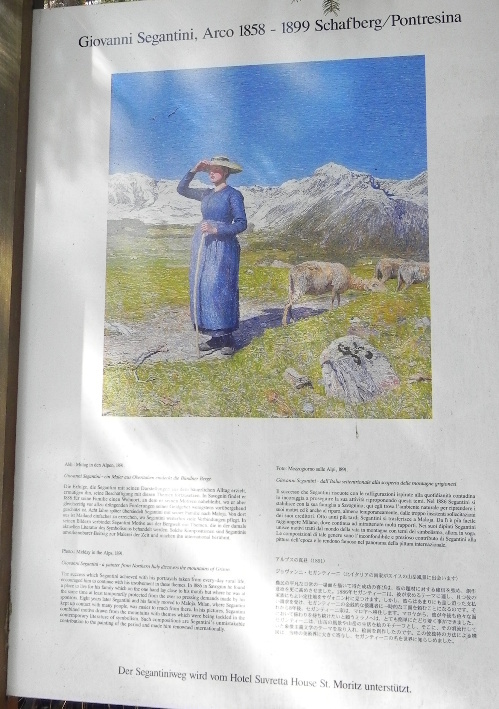 The path led was easy to follow and takes the vistor along the hillside while introducing the works of Giovani Segantini, a renowned artist, describing his life and work as it goes. This I found interesting, but my attention was drawn to what appeared to be black squirrels darting amongst the undergrowth and scampering through the trees. From what I can gather these are in actual fact red squirrels, with a very dark coat. I could have watched them all day but unfortunately time was limited, and I set off back the way I had came, then on to the town to hunt for souvenirs, not wildlife. 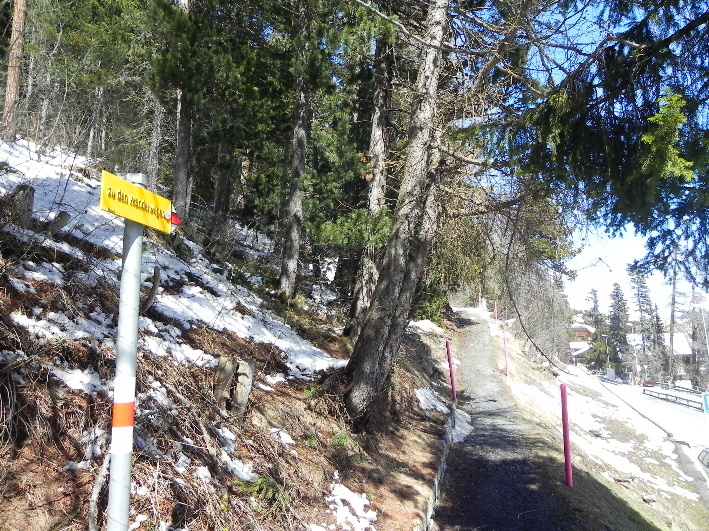 Footpath near the Segatini Museum. 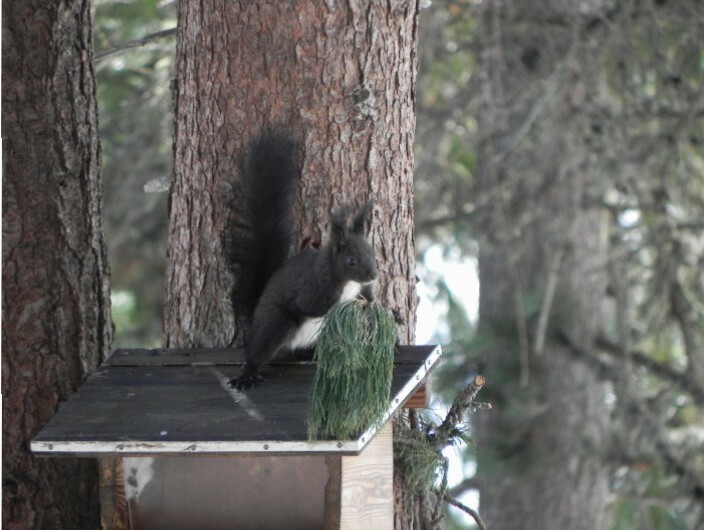 The local wildlife “Black” squirrels! 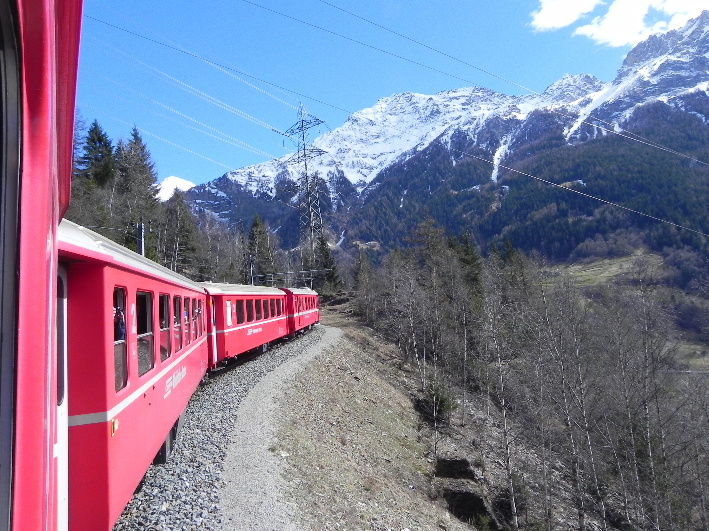 The Bernina Railway is without a doubt one of the most amazing journeys, and a model that our own West Highland Railway could take lessons from, with spotless clean carriages and observation windows. 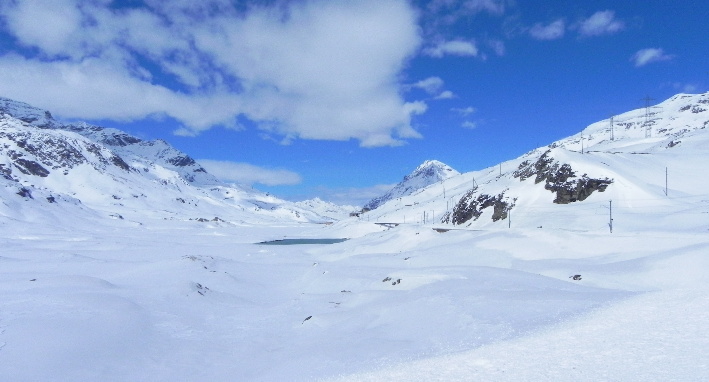 If you are able to, do not miss this stunning journey. You will not be disappointed.